My 31st birthday is less than a week away and I haven’t made too much of a dent in my 30-While-30 list. While there are a few things that I’ve made, but not photographed, the vast majority of items have remained untouched. So, I haven’t tried my hand at homemade fondant or whipped up English muffins just for the heck of it, but I did leave my corporate job, take a handful of classes and start a company. That has to count for something, right? I still want to finish my list, but there’s no way it’s happening with less than a week to go. I’ll come up with something. But in the meantime, I want to share this recipe with my readers. I added scones and shortbread (coming soon!) to my list because they pair beautifully with tea. While I certainly enjoy a cup of tea on the go, selecting a tea from my growing collection, brewing a pot and savoring it slowly with tasty treats has become a favorite past time. 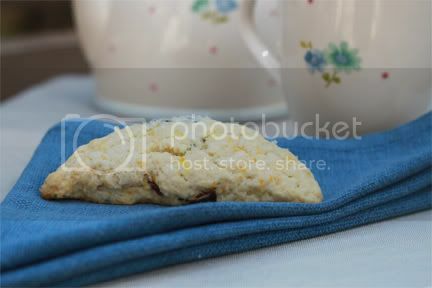 I first made these scones for an afternoon tea party Lisa’s (my fellow blogger!) house. We whiled away the afternoon in her dining room chatting, sipping icewine tea and nibbling on scones, shortbread, lemon bars, raspberry kuchen and tiny sandwiches. Thanks to the dark chocolate, orange zest and heavy cream, these scones are soft and rich with warm orange undertones. They’re delicious warm out of the oven or room temperature the next day. Pair with a piping hot cup of tea for a sublime breakfast or afternoon snack. 1. Preheat oven to 375 degrees F andline a baking sheet with parchment paper or a silicone baking mat. 2. Place the granulated sugar in a large bowl and add the orange zest and. Using your fingers, rub the orange zest and the granulated sugar together until the sugar is uniformly moistened. 3. Add the flour, baking powder and salt, whisking to combine. Stir in the chocolate chips. 4. Pour in the cream and, using your fingers or a fork, stir together until combined. 5. Pour dough onto a lightly floured surface and lightly knead to bring dough together. Pat into an 8-inch circle and cut into 8 triangles. 6. Place triangles on prepared baking sheet, brush with the melted butter and sprinkle with the granulated sugar. 7. Bake for 15-20 minutes, or until the scones are just lightly browned. Transfer to a cooling rack to cool completely. Store at room temperature.